Mix rice with 2 tbsp sesame oil and ½ tsp salt in a bowl and set aside. Pour 1 tbsp oil to a heated pan and pour in eggs to make a thin omelette over medium heat. The omelette should be pale in colour. Remove and let cool. Cut into thin strips and set aside. Pour ½-1 tbsp oil to a heated pan and quickly sauté carrots for about 30 secs. Season with salt and set aside. Saute the zucchini with minced garlic and ½ tbsp sesame oil. Remove and set aside. Sit a sushi mat on a board and place a nori seaweed sheet on top. Add ⅓-½ cup of rice on nori sheet, covering about ⅔ of the sheet. Place each ingredient on top of the rice, lining them up horizontally and close together. Roll the nori sheet using your mat until you have a cylinder shape. Squeeze the roll inside the mat gently so that the kimbap is not too loose. 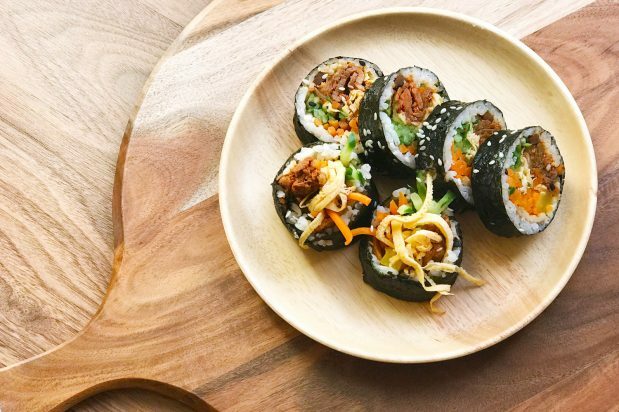 Repeat with the remaining ingredients until you have a desired number of kimbap rolls. Cut kimbap into bite sized pieces, usually 8-10. Garnish with sesame seeds. Other popular ingredients for filling for gimbap – fish cakes, crab sticks, ham, burdock root.